Minnesota is considering new ways to promote mental health. 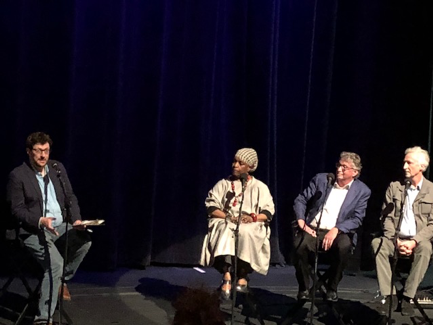 This week I was inspired by the event "Note to Self: A Conversation About Innovative Ways to Care for your Mental Well-Being," co-hosted by Minnesota Public Radio (MPR) and the Science Museum of Minnesota. Be nice to your gastro-intestinal tract. Get to know your elders and community members; sit with them, learn from them. Tell the truth–to yourself and to others. Keep your heart light; if something is making your heart heavy, deal with that, and then get some sleep. I was also inspired on May 1 when Extension Children, Youth & Family Consortium (CYFC) co-hosted more than 100 Minnesota organizational leaders who gathered to hear. Corey Keyes, Ph.D., speak about research on mental health—not mental illness. They heard Dr. Keyes explain the concept of “flourishing,” a measurable state of positive mental health and overall well-being. Then they explored together how this approach is different from “business as usual” within their organizations, and the changes needed to move toward mental health. Our organizational leaders understand that while it’s important to address mental illness, that’s a narrow approach that falls far short of our goals for a healthy Minnesota population. Instead, they are taking a broader approach and tackling the difficult task of changing our mental health service delivery systems. As Minnesota people and organizations move toward promoting mental health, the work of Extension Children, Youth & Family Consortium is changing, too. We at CYFC receive more and more requests for training about mental wellness and how to promote mental “flourishing” while combating the conditions that perpetuate mental “languishing,” another term from Dr. Keyes. Those conditions include general trauma (including historical trauma and secondary trauma), mass incarceration, adverse childhood experiences, and economic and educational disparities. To help promote mental flourishing, we in Extension CYFC focus on building and supporting more partnerships that take this approach in their mental health work. Now that others in Minnesota and beyond have distinguished between mental illness and mental health, we are engaging new organizations, academic disciplines, professional groups, and communities to meet the demands for training and consultation. Through these partners, we are deepening our relationships and widening our reach. Our Scholar in Residence program, which is focusing on early childhood mental health this year, also joins with partners in this work. At the same time, while many things are changing, Extension CYFC remains committed to the priorities outlined in a Family Matters article a year ago titled “Twenty-Five Years of Service.” We will continue to work across Extension, connect closely with our land-grant mission, and engage diverse groups of community and University advisors to inform our work. We will use a public health lens and an ecological framework in our approach to understanding and teaching about issues relevant to children and families. And we will continue to deepen our engagement with community groups. National Extension: Mental Health Promotion Leaders Google Group. University of Minnesota Mental Wellness Learning Community. Minnesota Mental Well-Being Resilience and Learning Community (hosted by the Minnesota Department of Health). Extension CYFC Scholar in Residence Team. Extension CYFC Cultural Providers Network. Contact me at cmichael@umn.edu for more information. I look forward to hearing from you.